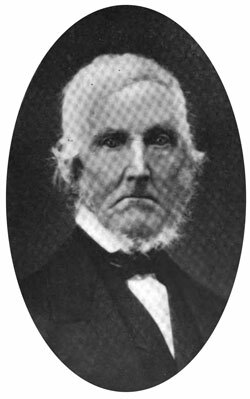 Orlando Lane Castle was born in Jericho, Vermont, on July 20, 1822, the third child (of eight, 4 sons and 4 daughters) to Augustus Castle and Almira Bostwick Lane-Castle (1795-1864). Their 8 children were: Sarah Celestia (1819-1864), Emily (1820-), Orlando Lane (1822-1892), William A. (1824-), Eunice Aurelia (1829-), Adoniram Judson (1832-1852), Alonzo (1827-), Mary Ellen (1837-1892). Augustus Castle (see the nearby image), born on 9 July, 1791 in Essex, was a industrious farmer in Jericho. Augustus' farm joined that of his brother, Joel, but in March, 1831, he moved with his family from Jericho to Alexandria, in the wilderneess of of Licking Co., central Ohio, where his brother Sanford had moved in 1817 and where Augustus will eventually buy a farm. Augustus Castle died on 22 March, 1880, in Granville, Ohio. Orlando's early intellectual opportunities were quite limited. His early life was stamped with that energy and strict economy which were indispensable to success on the part of those who extorted the means of subsistence from the earth by farming. At the age of eighteen the turning point of his life was reached, he determined to be a teacher. In 1846 Orlando graduated at Granville College (now Denison University), Ohio, securing the honor of his class. During his college course he was almost entirely thrown upon his own resources for the means to meet his expenses. In the winter he taught school, and during the last three years in college he taught lower classes. After graduating, Castle spent one more year as tutor in Granville College, and later, for several years he had charge of the public schools of Zanesville, Ohio, where he exhibited great efficiency and secured a high reputation as an instructor. In 1853, Castle accepted the chair of Rhetoric, Oratory and Belles-Lettres in Shurtleff College, at Upper Alton, remaining there for almost 39 years, closing his class work on Tuesday, 29 Jan. 1892, just a day before his death. Professor Castle received the degree LLD (Doctor of Laws) from Denison University in 1877. He was a metaphysician, a mathematician and a logician, an excellent teacher. Dr. Castle was a holder of patents not only for calculating machines (see the calculating machines of Orlando Lane Castle), but also for farming machinery—a grain-harvester, a grain-binder, a nut-lock, etc. Orlando Lane Castle married to Olive Loveland Thrall (b. in Granville, Ohio, on 14 Nov., 1830) on 15 August, 1848, and they had 3 children — Elizabeth, (b. 13 Oct., 1849—died 8 Feb., 1851), Lucius Marsh, (b. 16 Jan., 1852), Linus Thrall, (b. 12 Dec., 1853). Orlando Lane Castle died of pneumonia on 30 January, 1892, at Alton, Ill.